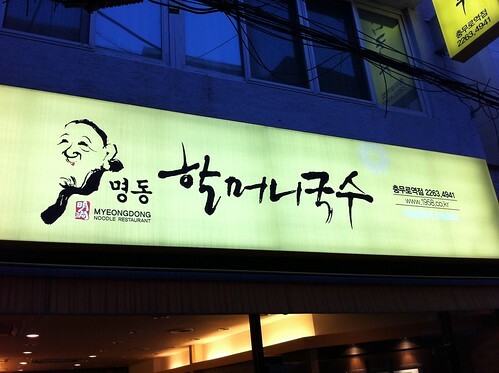 This month I'm working in Chungmuro and so have the chance to sample a few of the restaurants in the area. 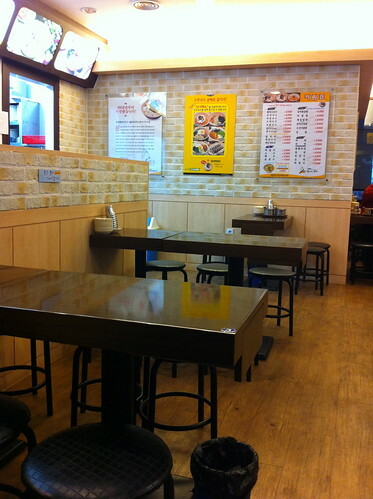 명동 할머니국수 (Myeongdong Grandmother Noodles) is located down a back street nearby the Hanok village and offers a very cheap selection of soupy noodles. 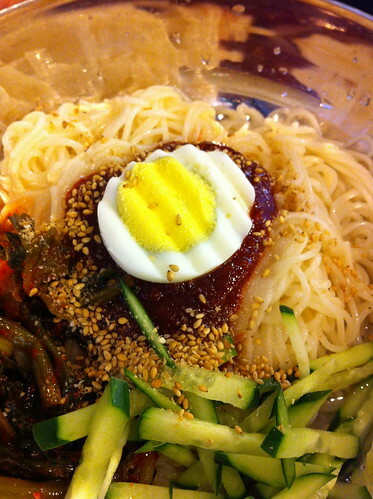 Prices start at 2,500 won for kimbab, tteokbokki or ramyeon, and the cheapest bowl of noodles goes for 3,500 won. Plus if you're peckish at breakfast time then you can sample their 북어콩나물해장국 (Pollock and Beansprout Soup) for a mere 3,000 won. Side dishes are minimal here, either pickled radish or cabbage kimchi. We went for the 보쌈국수 (Steamed Pork Noodles) for 6,000 won which turned out to be 비빔국수 (Spicy Cold Noodles) with a side of pig, plus a simple tofu soup. The pork was tasty enough, simple squares of steamed belly. The noodles looked pretty, but were a little too sweet and far too spicy. I love chili, but the red sauce here just made me feel uncomfortable both at the time of eating and the following morning (reminds me of a certain Johnny Cash song). If you fancy a cheap noodle lunch or dinner then 명동할머니국수 may be the place for you (they have branches all over Seoul), but be warned, the 비빔국수 is not for the faint hearted. Go to Chungmuro station, head out of exit 4 and turn left after the Nescafe. 명동할머니국수 is on the right hand side a little way up the alley. They're open from 7.30 am to 10.00 pm and you can call them on 02 2263 4941 or visit their website here.